No more dirty shoes! 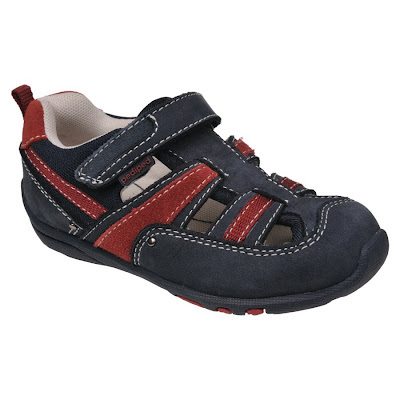 pediped Flex introduces lightweight athletic shoes and sandals in select machine washable styles. YES, I said MACHINE WASHABLE SHOES, such sweet words to me when I have boys who are like magnets to the mud!! We received the Joelle sandles in red and navy (photo on left) to try. Besides them being washable they are very cute and seem very comfortable for my toddler. Many people have complemented him on his shoes and I am asked where I got them. My toddler has had a few pair of shoes from pediped and both he and I have been pleased. He has worn every pair until his feet just could not fit anymore and a new pair was need. So for I have had no complaints with any of the shoes we have owned from pediped. In addition to the lightweight construction and thin profile, these sporty shoes also feature the addition of DRYZ technology insoles. DRYZ Technology is an effective moisture management and odor control material that regulates temperature and prolongs the life of shoes. In addition, DRYZ Technology also cushions impact resulting in added comfort for your child’s feet. Machine washable and DRYZ Technology – these shoes have got it all! To wash, simply remove the DRYZ Technology insoles and place shoes in the washing machine. For best results, wash shoes alone in cold water, on gentle cycle. Do not add bleach; use regular detergent. Allow shoes to air dry with Velcro open (away from sunlight) before re-inserting the insole. Do no put shoes in the dryer. Machine Washable styles include: Joelle, Joel and Adrian (boys) Amy, Adrian (girls and boys) Shop these styles now! While you are checking out pedipeds new line of washable shoes also check out the new Memory Foam line of sandals for boys and girls as well as a ballet flat line for girls. This new sleeker, sportier sandal design is lighter and ultra-flexible. The ballet flats are the perfect complement to any outfit. Best of all, both the new sandal and ballet lines incorporate a revolutionary use of Memory Foam Technology (MFT) to provide the ultimate in comfort and fit. Memory Foam Technology allows the shoe to mold to the child’s foot, acting like a custom insole, supporting the foot in all the right places. It also has excellent absorption, prevents foot slippage in the shoe and improves the fit of every shoe. Buy: The machine washable pediped line is available now at select retailers and at www.pediped.com in EU sizes 20-29 (US sizes 5-12.5). At a recommended retail price of $48 USD/pair (MSRP), the shoes are an excellent value. We just bought our first pair of pedipeds for my 8 month old daughter, and we love them! Thanks for this post -- now I'll have my eyes out for a sale on these for my dirt-magnet two year old!